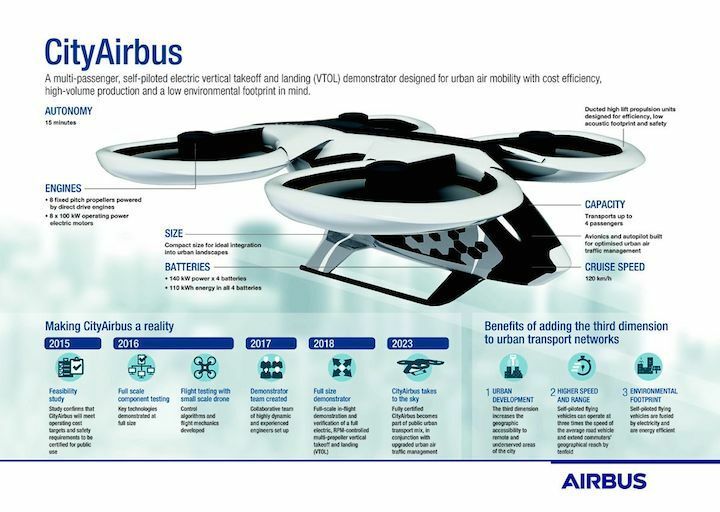 London, Airbus Helicopters has recently completed the first full-scale testing for the propeller-and-duct system of the CityAirbus demonstrator – a multi-passenger, self-piloted electric vertical take-off and landing (VTOL) vehicle designed for urban air mobility. During this successful testing phase, the CityAirbus team thoroughly checked the individual performance of the system, powered by Siemens electrical propulsion units. CityAirbus is a battery-powered air vehicle able to vertically take off and land. It is designed to carry up to four passengers over congested megacities to important destinations such as airports or train stations in a fast, affordable and environmentally friendly way. The innovative four-ducted propeller configuration significantly contributes to safety and low acoustic footprint. “We now have a better understanding of the performance of CityAirbus’ innovative electric propulsion system, which we will continue to mature through rigorous testing while beginning the assembly of the full-scale CityAirbus flight demonstrator” says Marius Bebesel, CityAirbus chief engineer. Tests of the fully integrated drivetrain, with 8 propellers and 8 specially designed Siemens SP200D (100kW operating power, direct-drive) drivetrains with exceptional torque to weight ratio are expected shortly. The full-scale demonstrator will be tested on ground initially. In the first half of the coming year the development team expects to reach the “power on” milestone, meaning that all motors and electric systems will be switched on for the first time. The first flight is scheduled for the end of 2018. In the beginning, the test aircraft will be remotely piloted, later on a test pilot will be on board. CityAirbus will be designed to carry up to four passengers on fixed routes with a cruising speed of 120 km/h. It will be initially operated by a pilot to ease certification and public acceptance, paving the way to future fully-autonomous operations.